24 | TH E M R EP O RT FEATURE The Paper Problem W hile online and mobile banking services repre- sent significant progress toward paper-free processes, banks have been slow to break the pervasive reliance on paper and manual tasks in loan process - ing. IT systems may be critical to customer retention, but the complexity, errors, and delays inherent in the prevailing paper- based mortgage processes are key contributors to customer dissatisfaction and attrition—the exact opposite result from what banks want. According to a global study by analyst firm IDC, 37 percent of document processes in financial services are still driven by paper. Copying, faxing, scanning, print - ing, and manual keying of data occur at every point of the loan process. A typical loan package can easily grow to hundreds of pages and completing the process can take over a month. Along the way, time, costs, and frustration add up as documents are sent by courier from branches to central scanning facilities, information is re-keyed multiple times off of paper documents into siloed systems that cannot capture data from scanned images, pages are lost, and errors are introduced. These inefficiencies appear to be the norm, rather than the exception. An InfoTrends study found that only 18 percent of branch banks scan loan-related paperwork directly into back-end electronic systems. IT integration is so lacking in some institutions that documents that start out in digital form are actually printed to paper so they can be scanned. Each error or missing page holds up the process until correct - ed, with customers losing patience and confidence over their lack of visibility into their application's status and the bank's repeated requests for the same information. And once loans are closed, regula - tions force lenders to get every- thing into the servicing system in compressed timeframes. Any missing information could create liabilities for the bank in the form of potential fines or write-offs due to errors if proper processes and supporting documents cannot be demonstrated. The origination process has grown so inefficient and costly—$6,253 net cost per loan according to the MBA—that in the first quarter of 2014 mortgage banks reported a net loss of $194 on each loan originated. To become more competi - tive, compliant, and efficient in their mortgage processing, banks need to capture documents and information electronically. By doing this, banks will eliminate the paper trail, automate manual steps and workflows, add security and control wherever paper is required or information is trans - mitted, as well as simplify the sharing of information between business units. And finally, the main factor all financial institu- tions are looking to do: save time and money. 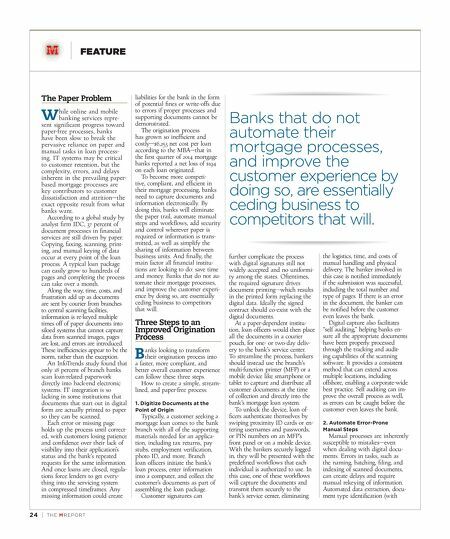 Banks that do not au- tomate their mortgage processes, and improve the customer experi- ence by doing so, are essentially ceding business to competitors that will. Three Steps to an Improved Origination Process B anks looking to transform their origination process into a faster, more compliant, and better overall customer experience can follow these three steps. How to create a simple, stream - lined, and paper-free process: 1. Digitize Documents at the Point of Origin Typically, a customer seeking a mortgage loan comes to the bank branch with all of the supporting materials needed for an applica- tion, including tax returns, pay stubs, employment verification, photo ID, and more. Branch loan officers initiate the bank's loan process, enter information into a computer, and collect the customer's documents as part of assembling the loan package. Customer signatures can further complicate the process with digital signatures still not widely accepted and no uniformi - ty among the states. Oftentimes, the required signature drives document printing—which results in the printed form replacing the digital data. Ideally the signed contract should co-exist with the digital documents. At a paper-dependent institu - tion, loan officers would then place all the documents in a courier pouch, for one- or two-day deliv- ery to the bank's service center. To streamline the process, bankers should instead use the branch's multi-function printer (MFP) or a mobile device like smartphone or tablet to capture and distribute all customer documents at the time of collection and directly into the bank's mortgage loan system. To unlock the device, loan of - ficers authenticate themselves by swiping proximity ID cards or en- tering usernames and passwords, or PIN numbers on an MFP's front panel or on a mobile device. With the bankers securely logged in, they will be presented with the predefined workflows that each individual is authorized to use. In this case, one of these workflows will capture the documents and transmit them securely to the bank's service center, eliminating the logistics, time, and costs of manual handling and physical delivery. The banker involved in this case is notified immediately if the submission was successful, including the total number and type of pages. If there is an error in the document, the banker can be notified before the customer even leaves the bank. Digital capture also facilitates "self auditing," helping banks en - sure all the appropriate documents have been properly processed through the tracking and audit- ing capabilities of the scanning software. It provides a consistent method that can extend across multiple locations, including offshore, enabling a corporate-wide best practice. Self auditing can im - prove the overall process as well, as errors can be caught before the customer even leaves the bank. 2. Automate Error-Prone Manual Steps Manual processes are inherently susceptible to mistakes—even when dealing with digital docu- ments. Errors in tasks, such as the naming, batching, filing, and indexing of scanned documents, can create delays and require manual rekeying of information. 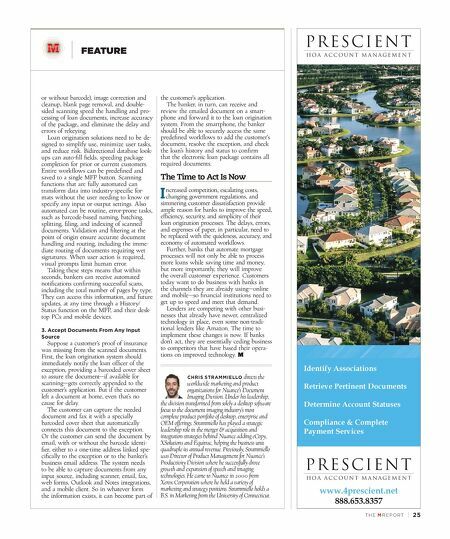 Automated data extraction, docu - ment type identification (with Banks that do not automate their mortgage processes, and improve the customer experience by doing so, are essentially ceding business to competitors that will.